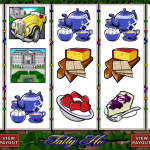 Escape the fox in Tally Ho video slot game from Microgaming and take all her riches. Fox hunting is long gone we assume but let’s take a ride back in history and give a tribute to this sport. But there is a twist here, instead of you hunting the fox, it will hunt for you. In this universe the fox is all dressed up and lives a life of luxury and you are its target. Tally Ho lacks in special features in big way. 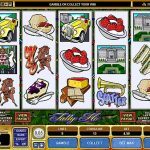 We have only the free spins as the main feature and that is it. The rearing horse is the wild and its function is to substitute for all the other symbols except for the scatter to complete a winning line and it doubles the wins as well. The hunting horn is the scatter symbol and it activates the free spins. You need to land 3, 4 or 5 scatters to receive 10 free spins. The only good news here is that not only the feature can be retriggered but also all your wins will be a subject to a x 4 multiplier. Do not let the cunning fox in Tally Ho from Microgaming outsmart you. Take all the wins from it and enjoy the ride. This is an older slot but still it has some loyal following and it also attracts new players. The game play is straightforward and the theme is very unique so that is probably the thing that keeps us interested in the long haul. This is a 9 liner so the betting options are somehow limited, only high bidders will be disappointed, but still they can try the game for a change. For something a bit more sunny consider playing Spring Break a 5 reel slot by MicroGaming.